I have four cards to show you today, all using the third technique taught in the recent online watercolour for card makers classes. 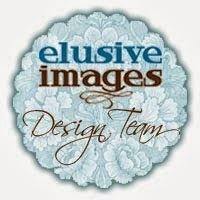 All stamped background images were stamped with Versamark ink and heat embossed using Wow! Opaque Bright White Super Fine embossing powder. I then used my Winsor and Newton Cotman watercolour paint set to add a watercolour wash over each background. The white embossing acted as a resist and gave a lovely result. For my first card I stamped the Big Bold Background Belle Flowers by Chocolate Baroque (USQSP0407) onto Bockingford Watercolour paper and heat embossed. I used three colours of paint for the watercolour wash, which I did using a wet on wet technique. I layered the panel onto orange and blue card and a 6" square scalloped card blank. 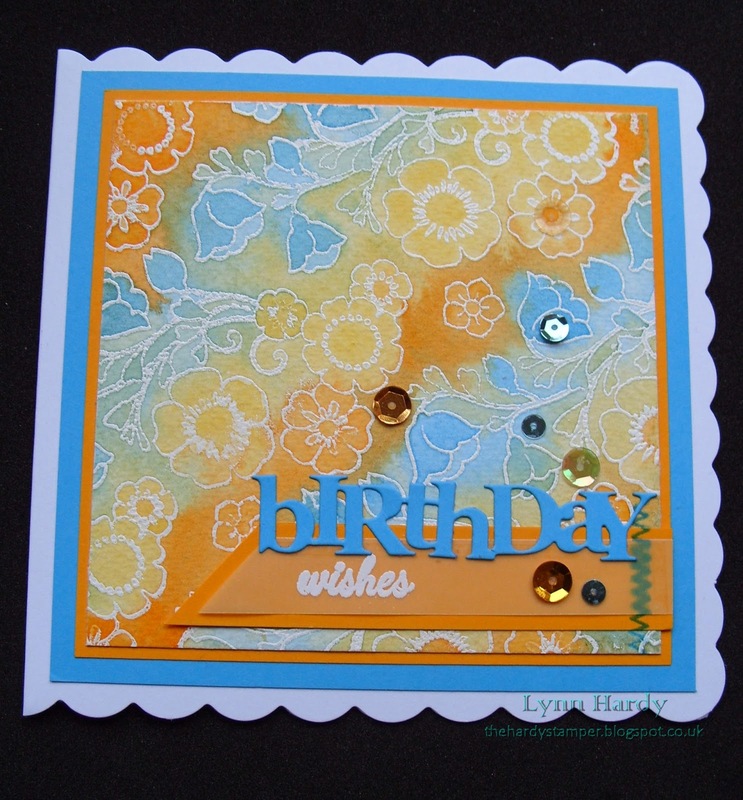 The Birthday die cut and wishes stamp are by Papertrey Ink and I added faux stitching with a Hot Off The Press stamp over the velum and orange card strip. Finally I embellished with a few sequins, which I stuck on with Ranger's Studio matte multi-medium. 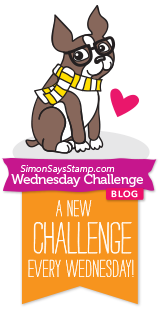 My second card was made in much the same way, but this time using the largest stamp from Wendy Vecchi's Art Colors Life set (LCS053). I chose Purple Lake, blue and Viridian green paints for the watercolour wash and used Bockingford watercolour paper again. 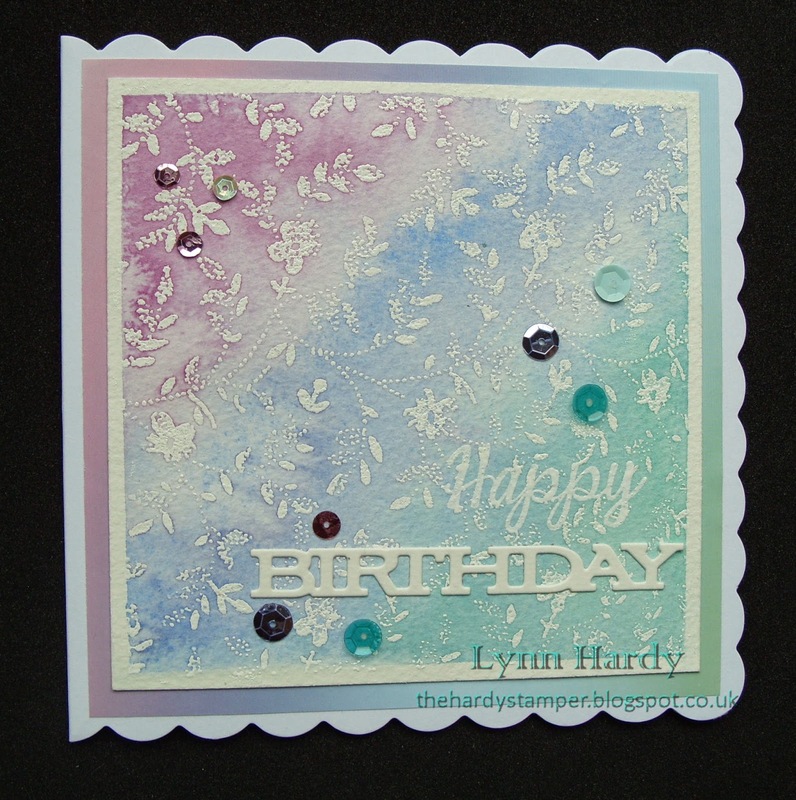 The "Happy" stamp is from Clearly Besotted's "Happy Everything" stamp set and the Birthday die cut is by Papertrey Ink. I also used sequins to embellish this one. Please click on each photo for a better view. 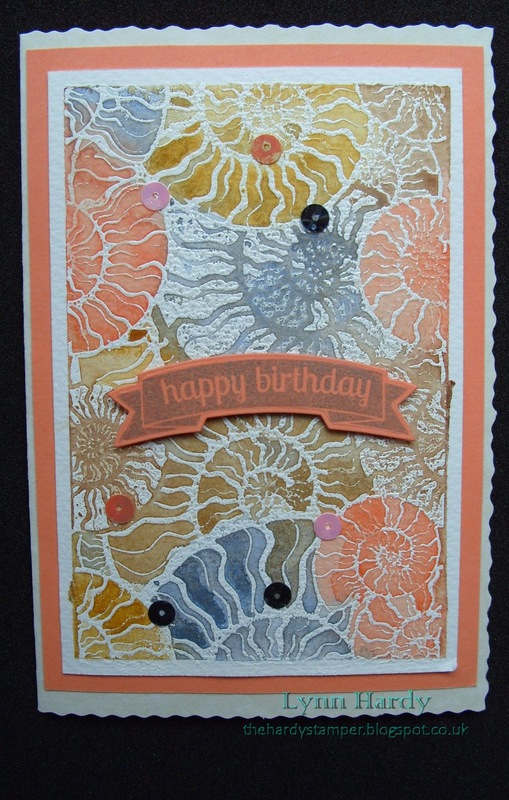 For my third card I used the beautiful background stamp from Joanna Sheen's Tales of the Ocean - Fossil stamp set (JS317). Using Bockingford watercolour paper again I painted with a selection of coral, grey, yellow ochre and beige coloured paints, but this time I tried to keep within the shapes of each fossil, rather than blending the colours too much. The panel was mounted onto coral coloured card and a mottled beige C6 card blank. 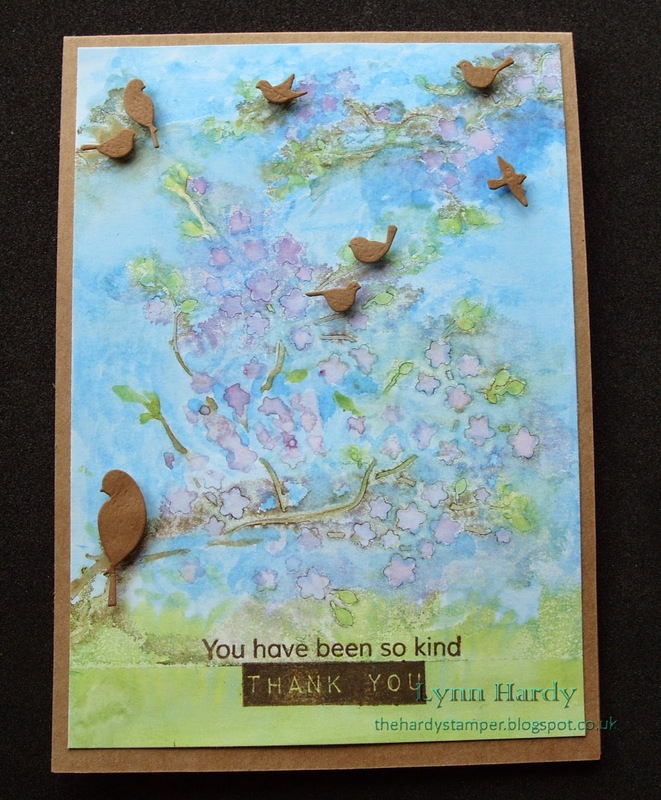 The sentiment stamp and die are from Clearly Besotted's Mini Basic Banners set and I used Memento London Fog ink. Once again I embellished my card with a few sequins (these came from Abakhan). My last card is a lager 8" square one. 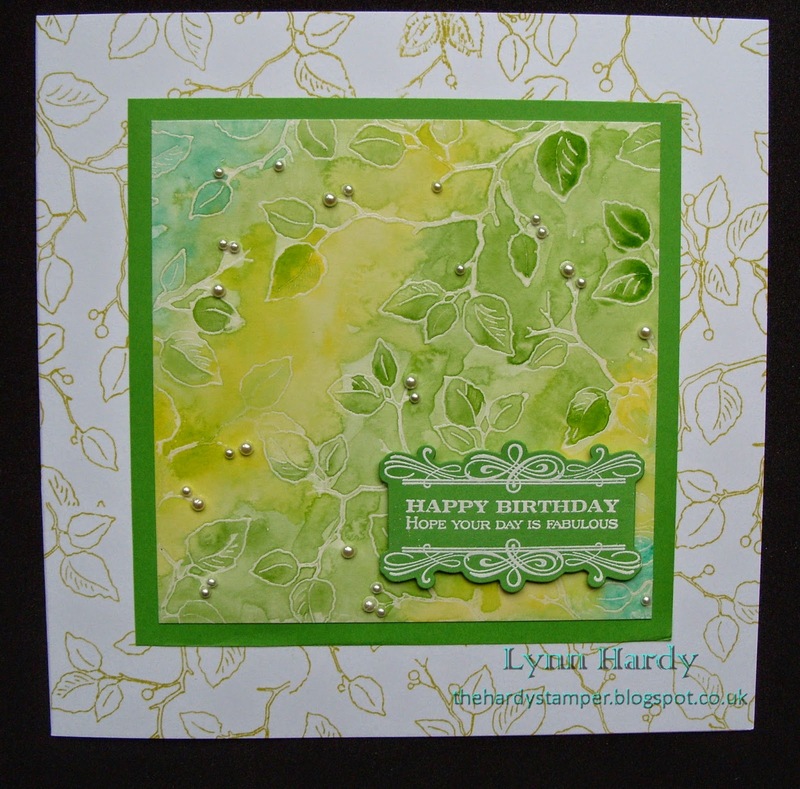 This time I used smooth white card as I wanted to capture the detail from the lovely Big Bold Background Leafy Trails stamp by Chocolate Baroque (USQSP0406). For my wet on wet watercolour wash I chose Lemon Yellow, Sap Green and Viridian Hue paints and blended them together where they met. I used the same stamp and Memento Pear Tart ink to stamp the white card blank, layered the panel onto green card and added a die cut and stamped sentiment (from Papertrey Ink). Finally I embellished with two different sizes of pearls, which I placed where each berry was on the stamped image. I was really pleased with how this turned out - it looks so fresh in real life! Labels: Bockingford Watercolour paper, Chocolate Baroque, Clearly Besotted, Hot Off The Press, Joanna Sheen, Memento dye ink, Papertrey Ink, Wendy Vecchi, Winsor & Newton Cotman Watercolour paints, WOW! I decided to make a second card using the same technique as in lesson two (see my post below this one), but this time using Pastel shades of Distress ink. I selected Spun Sugar, Squeezed Lemonade, Bundled Sage and Shaded Lilac and used Bockingford watercolour paper again. Please click on the above photo for a clearer view. I mounted my watercoloured panel onto a pale pink card blank. The sentiment and basket of wool stamps are both from Newton's Nook "Basket of Wishes" stamp set and I used a black dye ink to stamp them onto watercolour paper. 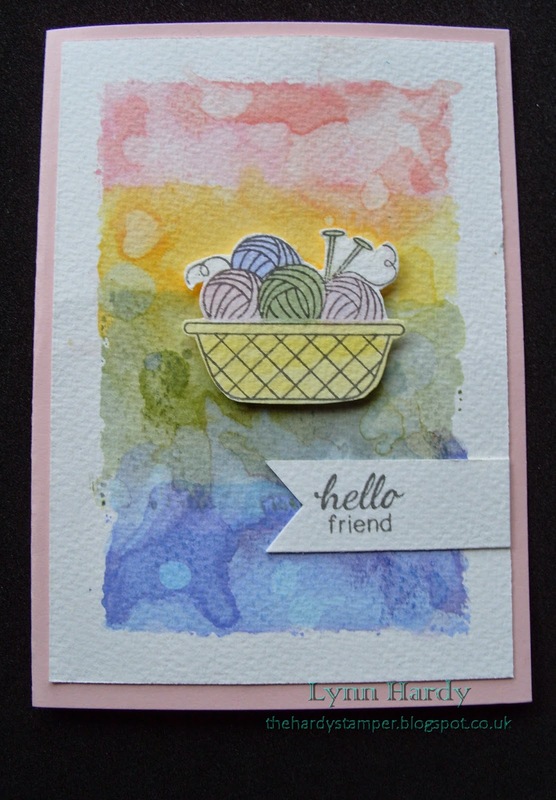 The basket and balls of wool were coloured using the same four shades of Distress Ink Markers, I fussy cut it out and mounted it to the card with foam pads. I think the finished card looks really effective and I will certainly be making more backgrounds like this one. In the second lesson of the online watercolour for card makers classes Laura Bassen showed us how to make great backgrounds using an acrylic block and a selection of Distress ink pads. Please click on the above photo for a more detailed view. For my card I chose to use Picked Raspberry, Spiced Marmalade, Mustard Seed and Peacock Feathers Distress inks and Bockingford 300g (140lb) Cold Pressed watercolour paper. The inks were applied to an acrylic block, one at a time, spritzed with water and "stamped" onto the watercolour paper. The water allowed the inks to blend together nicely, producing a really bright background. I tried this technique a few times - it was really easy and each background was unique. 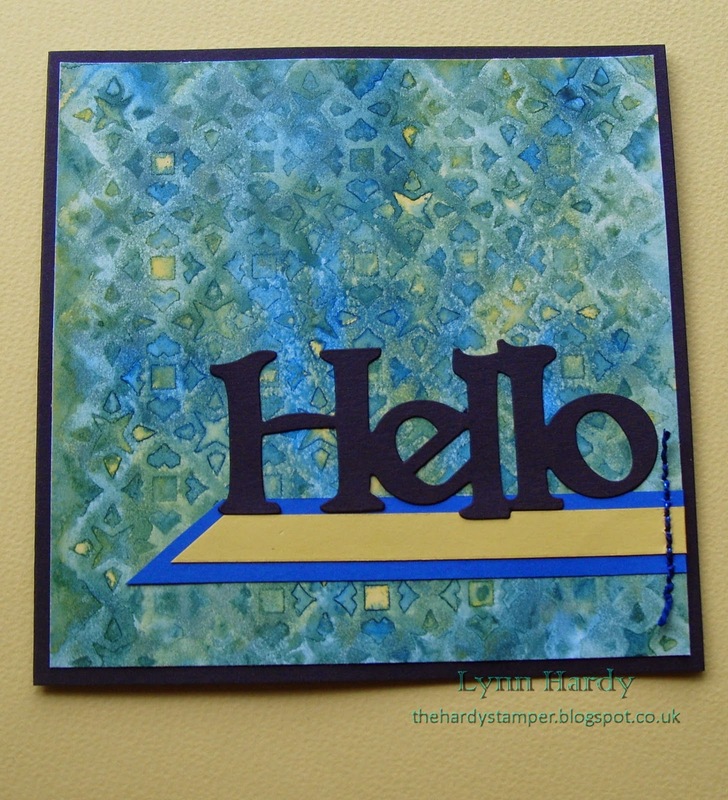 My final card in this series from lesson one in the watercolour for cardmakers online class is a bright one, done with The Crafters Workshop Mini Marakesh stencil and yellow and blue paints. These produced a lovely range of green colours when they mixed together on the wet paper. I simply trimmed and mounted my square background panel onto a black 6" square card blank and added a couple of strips of blue and yellow card to ground my sentiment. I added a row of hand stitching to the edge of my card strips then added a black die cut sentiment from a Sizzix die. I think that this flat card will be ideal for posting but still has some interesting details. My fourth card in this series is a slightly larger one - this time using The Crafters Workshop Mini Cherry Blossoms stencil. I wanted to see if I could watercolour a background which wasn't quite so abstract, so I chose this stencil of birds sitting in a cherry tree and used pale blues, green, brown and pink paints. The pooling of the watercolour paint in the spaces left by the stencil gave a lovely edge to the flowers but the birds weren't very clear, so I decided to die cut a flock of them using Memory Box dies instead. I mounted each bird onto my card with tiny foam pads, so that they look like they are perching on the branches or flying. Please click on the photo above for a better view. The sentiment is another from the useful Clearly Besotted "Many Thanks" set. I stamped it straight onto the background using Potting Soil Archival Ink. I really like the subtle, dreamy quality to this card! 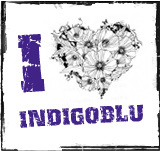 My next card using the watercolour and stencil technique is a softer colour palette of blues, lavenders and lilacs. I chose The Crafters Workshop Mini Cubist stencil and the result reminds me a little of the works of Gustav Klimt - what do you think? 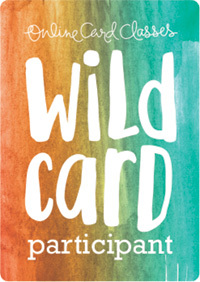 I found the die cut banner in my stash (I think it's a Sizzix one). The sentiment is from the "Many Thanks" set by Clearly Besotted and I curved it slightly on my acrylic block, so that it fitted nicely onto the banner. I heat embossed the sentiment with Wow! Opaque Pastel Purple and mounted the banner to my card with foam pads. 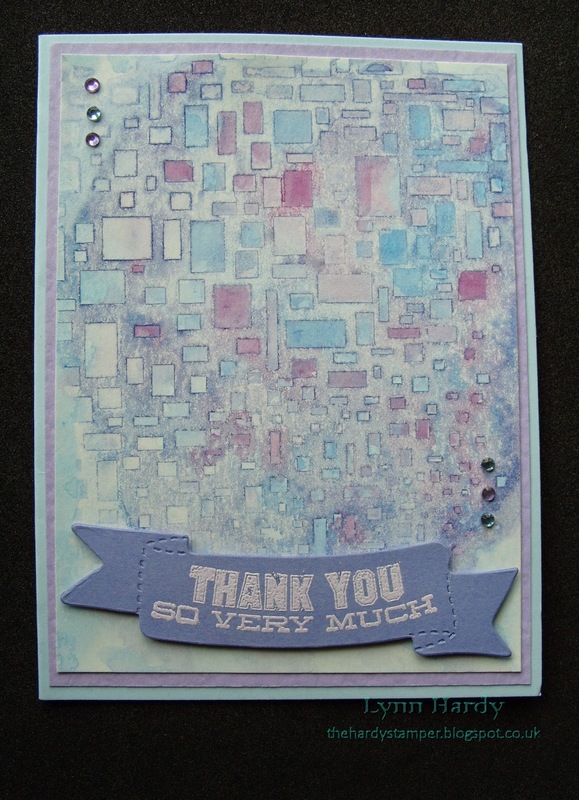 Finally I embellished the card with a few tiny blue and lilac gems. I was really pleased with how this one turned out and would definitely recommend using this particular stencil for this technique. 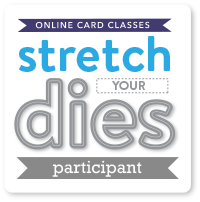 I'll be back shortly with the next card in this series. I have been taking an online class, Watercolour for card makers, and have been trying out lots of different techniques. Some are new to me and others I'm revisiting - but all have been lots of fun! We were set homework after each day, so my next few posts will be showing what I made for that - thankfully none of my assignments look like the dog has eaten them! The first lesson on day 1 was to make soft watercolour wash backgrounds using stencils. I got carried away with trying out different stencils for this and ended up making five cards using this technique. 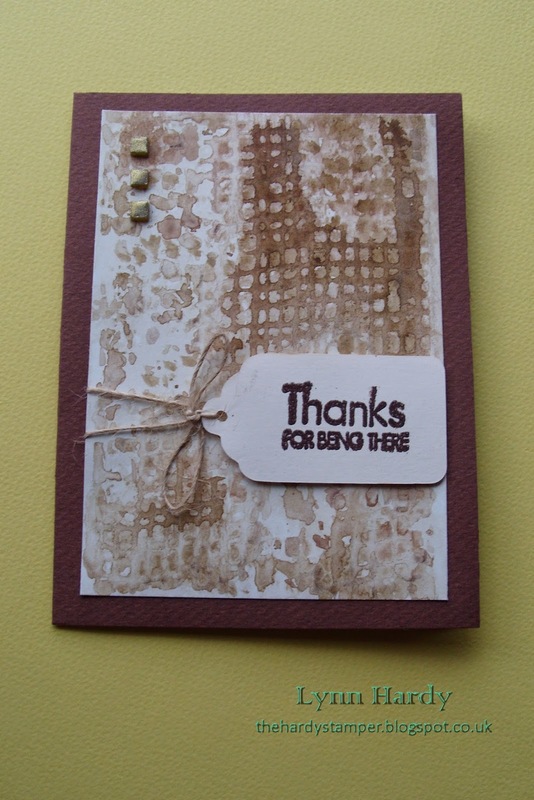 For my first card I used a Tim Holtz layering stencil - Burlap (THS007) and a selection of brown shades of watercolour paint on Strathmore Bristol smooth paper. The tag was stamped with a sentiment from Kaisercraft (from their Friendship Sentiments set) and this was heat embossed using Zing Chestnut embossing powder. I added a bow from button twine to echo Jennifer Rzasa's original design, but I felt that it needed a little more embellishment, so I added three small gold mosaic tiles. 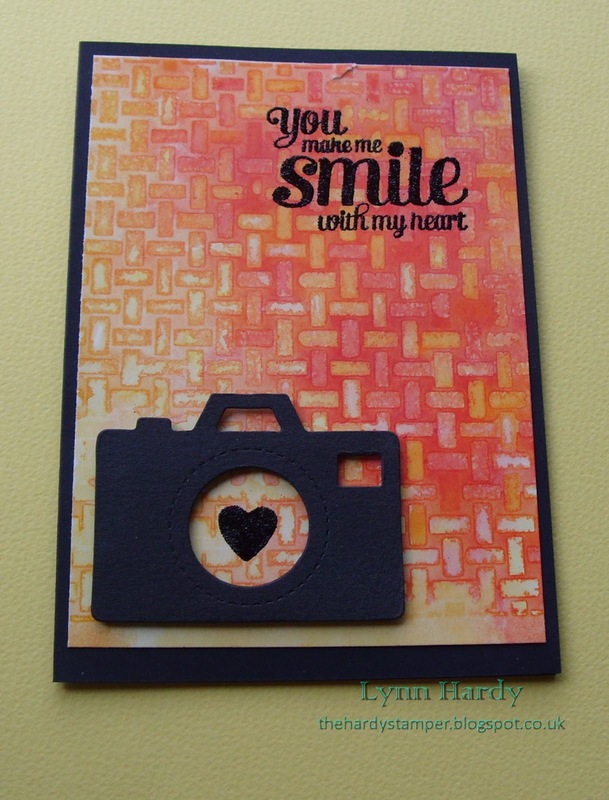 My second card was made in a similar way, but using The Crafters Workshop Mini Basketweave stencil and yellow and red paints. 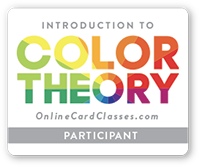 This is very vibrant in real life and looked good on a black card blank. The sentiment is from Waltzingmouse Stamps' Compact Sentiments set and the small heart is from their Sweethearts set - I heat embossed them both using Wow! Black Glint embossing glitter. You can't see in the photo, but it's actually really sparkly! The die cut camera was mounted with foam pads for extra dimension. 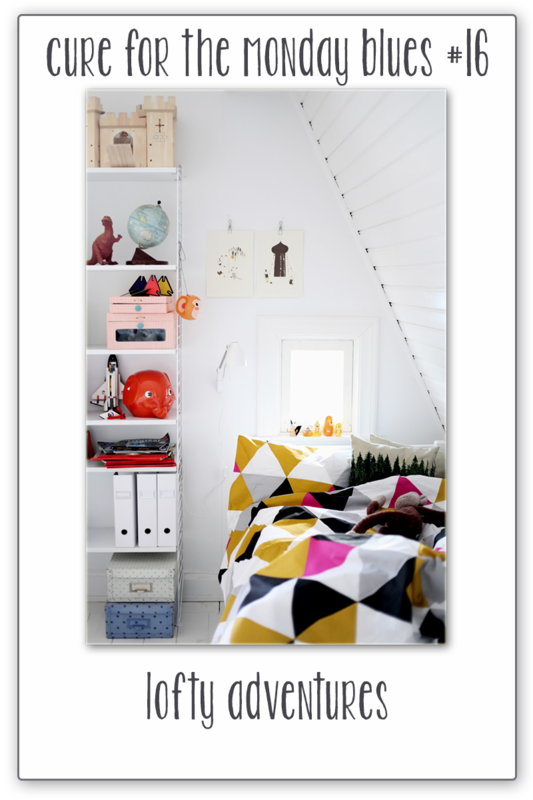 This week Taheerah Atchia has chosen an inspiration photo which I found truly challenging! 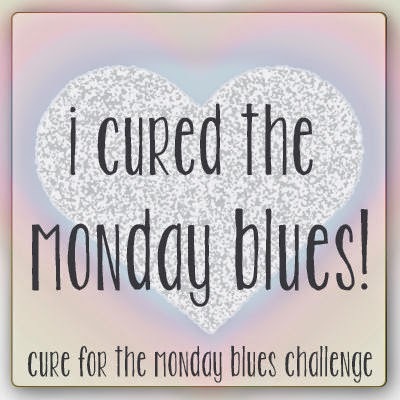 Taheerah's card is fresh and modern looking - check it out here http://littlemisst-papercraft.blogspot.com/2014/05/cure-for-monday-blues-challenge-16.html . I decided to use the geometrical pattern on the bedding as my main feature and found a small triangular stamp in the "On Deer" stamp set by Kelly Purkey for Simon Says Stamp. 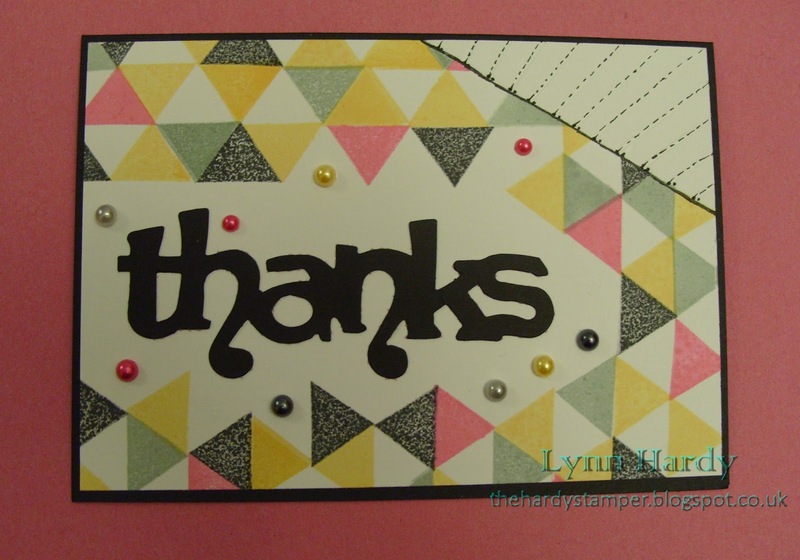 I used Memento dye inks in Canteloupe, London Fog, Rose Red and Tuxedo Black to stamp my pattern. I scored several lines at the top right of my card to represent the boarding on the ceiling and highlighted them with a very fine black Pitt pen. 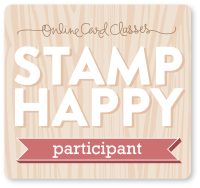 I don't have any really large sentiment stamps that would have been suitable, so I used a Sizzix die cut instead. Finally I embellished with a few coloured pearls. I hope you like it! I am a regular visitor to Sanketi's blog, The Storyteller http://sanketij.blogspot.co.uk/ . She does some wonderful watercolour paintings incorporating stamping and I greatly admire her work. In fact it was Sanketi who inspired me to start going to evening classes last year to try to improve my drawing and painting skills. 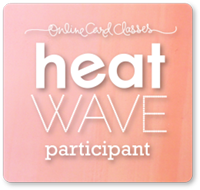 I am really enjoying the classes and have learnt a lot, but I am far from any good yet and have not been confident enough to include any freehand painting in my cardmaking before. 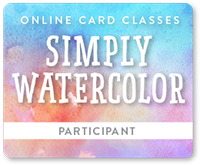 Online card classes are currently running a "watercolour for card makers" course and Sanketi is one of the guest tutuors. She kindly gave away one place on the course as blog candy and I was lucky enough to win it! The lessons started on Monday, with a series of videos each day showing various techniques, lots of tips and interactive aspects such as galleries and helpful forums. I used some Bockingford 140lb cold pressed watercolour paper, a round paintbrush and a fine black Faber Castell pitt artists pen to produce the colour chart below. Please click on the photos for an enlarged view if you'd like to read the names of each colour. 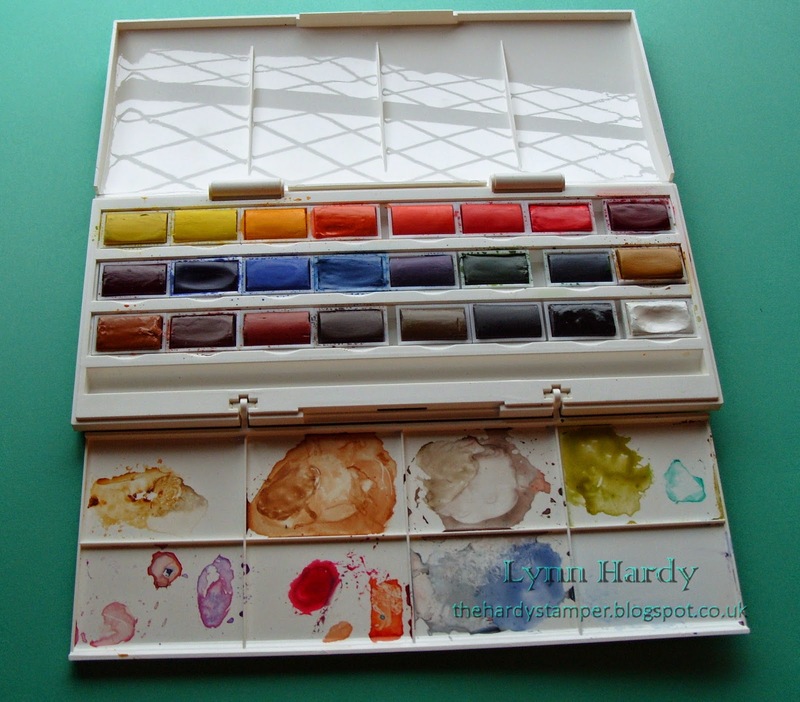 My colour swatch chart just fits inside the lid of my paintbox, so will be just the job when I'm selecting the colours I need. 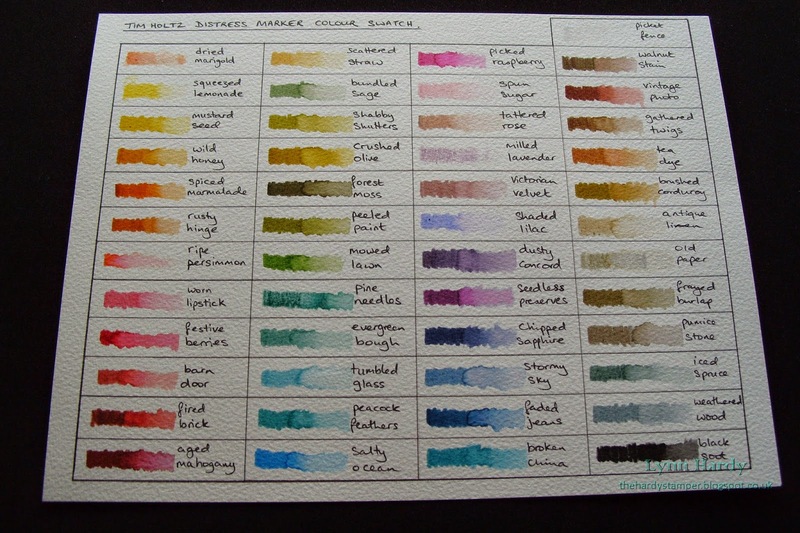 I also decided to produce a colour swatch chart for my 49 Tim Holtz Distress Markers in a similar manner. Again I used Bockingford 140lb cold pressed watercolour paper, a round paintbrush and a fine black Faber Castell pitt artists pen. Each marker was scribbled onto the paper and then I took a damp brush and added a little water to each colour, so that it's easy to see what the markers would look like when used for watercolouring. I am pleased with the finished swatches and think that it was a good idea to make them, so I intend to make some more when I have time. I have some nice watercolour pencils and some twinkling H2o's, so that might be a good place to start next time. 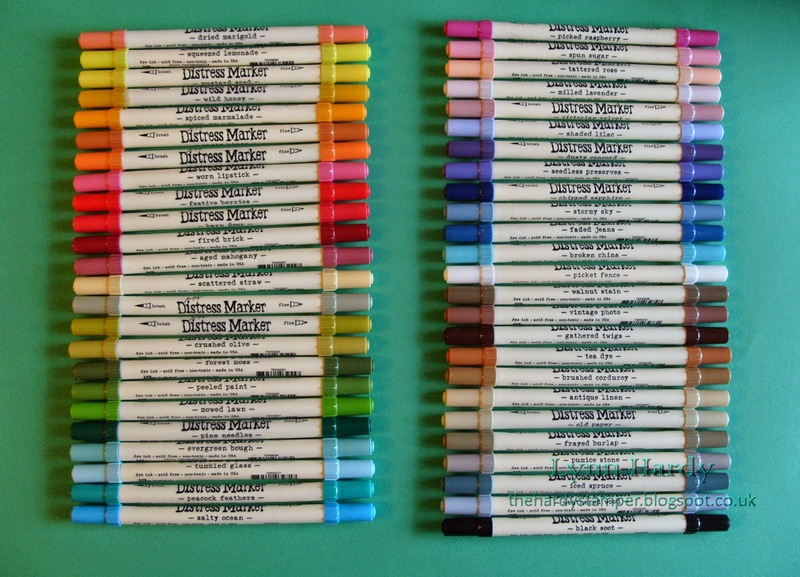 Why don't you try doing a similar thing with your supplies?! This week Taheerah has chosen another bright and cheerful inspiration photo for her Cure for the Monday Blues challenge no 15. You can check out all the details on her blog here http://littlemisst-papercraft.blogspot.com/2014/04/cure-for-monday-blues-challenge-15.html . I started with a 5" x 7" white card blank and used two of the smallest stamps from the Waltzingmouse Stamps "Funky Feathers" set to imitate the petals on the acrylic chairs and paper plates. 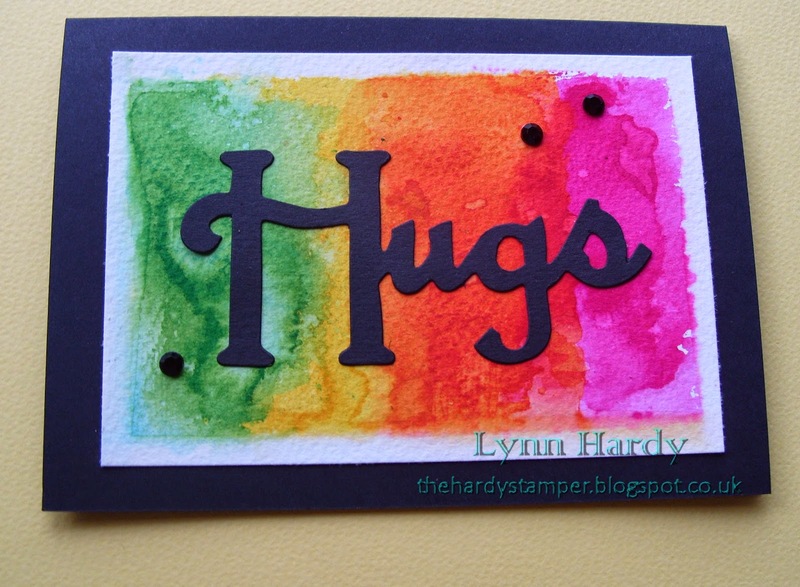 I used Papertrey Ink Melon Berry and Berry Sorbet inks, stamping them onto scrap paper first so that I could use the second generation of ink on my card front. Then I added the sentiment, from Waltzingmouse Stamps "Vintage Garden Seed Packet", using Versamark ink and heat embossing with gold embossing powder. Please click on the photo for an enlarged view. I stamped the carnation from the same stamp set three times onto different coloured card and another three times onto green card, fussy cut them out and paper pieced them to make my three carnation flowers. The vases were cut from Memory Box dies, Candy Jar and Vintage Apothecary Jar, the lids were discarded and the bases of the round ones were cut down to size and paper pieced together to match the vases in the inspiration photo. I used narrow heat proof tape (the red lined sort) to define the gold areas on the vases, which I then heat embossed with gold embossing powder. 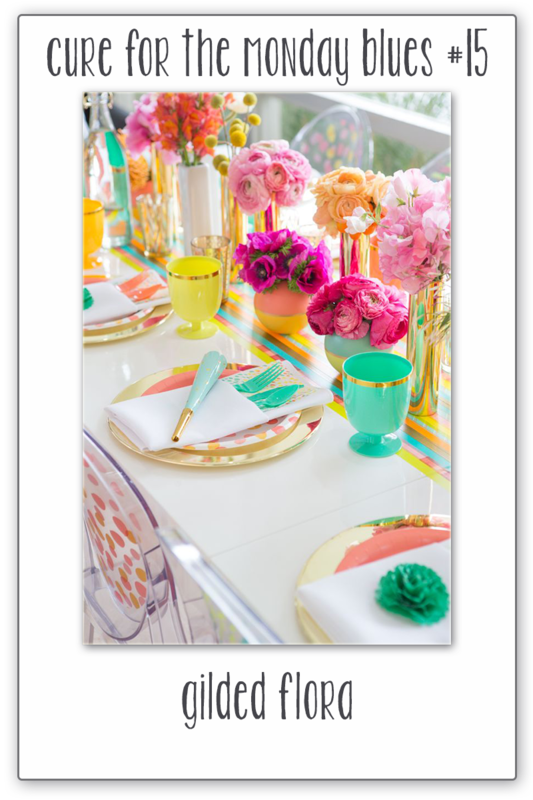 Finally I used foam pads to stick my flowers and vases to the card front, following a diagonal layout, similar to the display on the table in the photo. 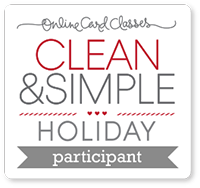 I really enjoyed making this card, although it was more time consuming than I expected! Thanks for looking.